I just received this camera about a week ago. Took it to Muir Woods and took outstanding pictures. Still learning all of the different manual options this camera offers which are many. One other very small gripe is the ability to "preview" the last picture taken is not possible unless you slide the lever down. Wish it were possible to have a one button click to view the last picture taken. Other than these very small gripes this camera is excellent. I would highly recommend this camera. This is my second Canon digital camera and my 720 IS had a problem with the optical focus and lens cover. Since this occurred 10 months into the warranty year, I contacted Canon online. They asked me to return the stripped camera with the necessary paper work, which i did. After receiving the camera, Canon Factory Service Center kept me informed of the status of my camera before and after the repairs. I was told when the camera was shipped. In addition, 3 months of warranty were added for the repaired parts. All of this happened within a week's time. I don't know what more I could ask from a service repair facility. Perfect pocket camera for taking on trips for someone who wants more control over their photos than the usual point and shoot. I have used it camping, boating, biking, hiking, flying, and for all sorts of other outdoor activities where a larger camera would be impractical. All controls accessible with one hand. The program mode allows me to permanently suppress the flash (I almost never use it) and the image stabilization allows slow shutter speeds in low light conditions. The shutter priority, aperture priority, and manual modes give me all the flexibility I could want in setting exposures. The combination of 6X optical zoom, 8 megapixels, image stabilization, and AA batteries cannot be found in any other camera this small and light. The optical viewfinder is great for bright conditions where the LCD screen is washed out. The viewfinder crops the actual image - you should zoom in tighter than you normally would. The camera has a few flaws. At the higher ISO settings (800 and 1600 but also a little at 400) the images start to go a bit grainy (but still usually yield good quality up to 8x10 enlargements). The camera does not do well with regular alkaline battteries - the low battery indicator lights up early and the camera soon rejects the batteries even though they have plenty of power for other devices. I think it has to do with the battery's voltage characteristic. Rechargeable Lithium ion batteries, however, do very well in it. Alkalines are good for backup if nothing else is available. But these problems are small compared to the utility this camera provides in a small, inexpensive package. If you have someone else using the camera who is not comfortable with all the settings available, you can simply switch it to auto mode and let them point and shoot. Be sure to fill out your warranty information! I loved, loved, loved this camera. When I showed people prints they would say "wow, these are great photos, what kind of camera do you have?" BUT, after 6 months, it just stopped working. I was using it, turned it off & I wouldn't turn on again. I brought it into a camera shop to see if it could be repaired & they said that they had seen 3 of these 720 cameras that had exactly the same problem. So, don't do what I did, which is not bother to fill out the warranty information. I won't make that mistake again! Great pictures, easy to use. 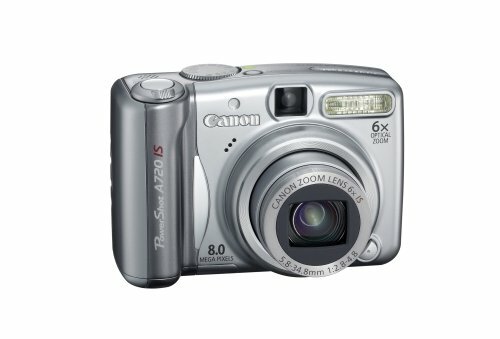 This is my first digital camera, so I had no idea which of the hundreds to buy. Consumer Reports listed this model as its "Best Buy" and that's why I purchased it. I am very happy with the quality of pictures, which are much sharper than I was getting with my 35mm film camera and I find it very easy to use, even for a digital beginner. The instruction book was a pleasant surprise as it was actually written by a native English speaker and was very step by step and easy to follow. My computer would not accept the CD that came with the camera, and regardless of the dire warnings that you "must" download the CD before copying pictures from the camera to the computer, I took a chance and connected the camera to the computer and the pictures went to "My Pictures" in the computer without a hitch. Canon A720IS: A-Series Capability and More!! Firmware Flaw: Can't use cheap or rechargeable batteries, Duracell only!!!! This camera has a firmware flaw: The firmware that interprets the batteries voltage is preset for high quality batteries only, if you use rechargeable or cheap off brand batteries, the camera is useless. They need to fix it so you can select the type of battery you are going to use and not shut the camera down in low voltage conditions. Sensor Quality: I found that my PowerShot S50 takes much sharper photos at the same speed, and is higher quality. I generally use the S50 for indoor pictures as the A720IS has very poor performance (lots of image noise). THIS IS A GOOD CAMERA FOR OUTDOOR PHOTOGRAPHY WHEN USING DURACELL BATTERIES!! I've had mine for about six months and really like it. I usually shoot with a Nikon D70 DLSR and have a bunch of lenses for that, but this little Canon is great for casual shooting. I use it for 'snap shots' of the family when it is more important to get a candid shot of the people then to have the best technical shot. It is so much smaller then a DSLR so it is much easier to travel with. The manual controls are very good, they are easy to access and cover pretty much everything you need. I often shoot in either aperture priority (Av) or shutter priority (Tv), but also sometimes shoot in either full manual or full auto. The eight megapixels is more then I need for this kind of camera and ends up just adding noise to the images that causes anything over ISO 400 to be unusable. I keep the ISO at or below 200 when possible and get the best results at ISO 80, but ISO 400 is still usable. There are other Canon cameras that are much smaller like the SD850 IS, but I prefer the A720 IS because of the manual features and it has a nice grip that makes hanging onto the camera easy. But the SD850 IS is a better camera for novice shooters where simplicity and small size are more important. Another important difference between the SD850 and the A720 is that the A720 uses two AA batteries, the SD850 uses a rechargeable lithium-ion. The lithium-ion battery is much better, it takes more shots on a charge and cycles the flash much faster. The AAs cause the length of time between shots with flash to be very long. Rechargeable AA batteries work better for this then non-rechargeables, but are still not as good as lithium-ion. The best way to use either camera is to have backup batteries with you so you never run out of power. A great little camera and a Consumer Reports "best buy"! I got this camera for Christmas. It is great for most types of photos. Consumer Reports recently listed this camera as a "best buy". Its predecessor, the A710, had also been a best buy. Canon seems to update their cameras every year, so my guess is that this camera's successor is due to be released within the next few months. If you just want a point-and-shoot that does all the work for you, then keep this camera in "auto" mode and forget about all the other settings. If you are an experienced SLR photographer, go ahead and put it in manual mode for a near-SLR experience. I have noticed that the lens does tend to slightly, but noticeably, curve straight vertical lines. Also, as with most point-and-shoot cameras, while the LCD screen is WYSIWYG, the viewfinder is not--especially when zoomed in. Remember that for ALL auto-focus cameras, you should press the shutter button down half way so the camera can focus on the subject. Then press the shutter button down all the way to take the shot. This is no different than other point-and-shoot digital cameras.